Amaze your loved ones by gifting them this Enchanting Delicacies Ferrero Roacher Chocolate Bouquet and make them crave for more. 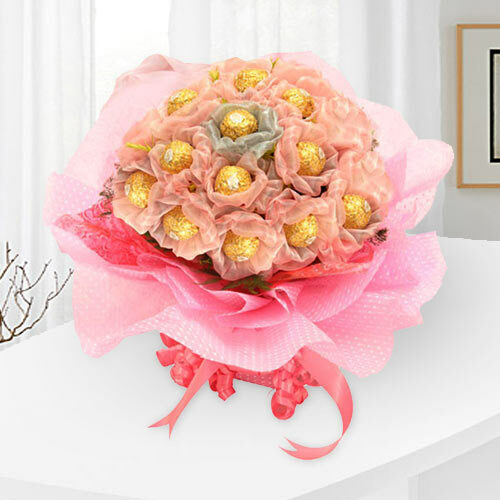 This Chocolate Bouquet is combined with 16Pcs Ferrero Roacher Chocolates. Note: The design of this Chocolate Bouquet may vary. We deliver this product across India. Same Day Delivery Available only for Ahmadabad, Bangalore, Chennai, Coimbatore, Delhi, Ghaziabad, Gurgaon, Howrah, Hyderabad, Jaipur, Kolkata, Mumbai, Nagpur, Navi Mumbai, Noida, Pune, Thane, Trivandrum. For Other Location it will be sent through courier.